iPhone X / 8 / 7 / 6s / 6 / Plus, iPad Air / Air 2, iPad mini / mini 2 / mini 3, iPad (4th generation), iPod nano (7th generation) and iPod touch (5th generation). This cable's Lightning Connector doesn't fit LifeProof or OtterBox iPhone X / 8 / 7 / 6s / Plus cases. The Anker Advantage: Join the more than 20 million powered by America's leading USB Charging Brand. Superfast Charge: 2.4 amps of power charges your iPhone, iPad or iPod as fast as possible. Certified Safe: Anker's MultiProtect safety system ensures complete protection for you and your devices. 12 / 24 volt input voltage. Incredibly Compact: One of the smallest car chargers on the market. (Note this charger's lightning connector does not fit Lifeproof or Otterbox iPhone X / 8 / 7 / 6s / Plus cases). 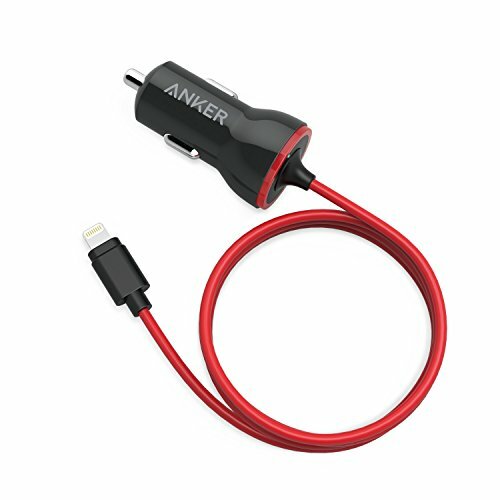 What You Get: Anker PowerDrive Lightning (12W car charger with built-in 3ft Lightning Cable), welcome guide, our fan-favorite 18-month warranty and friendly customer service.